Mumba Malila: A Supreme Court Justice for our time | Elias Munshya, LL.M, MBA, M.DIV. At the age of 50, newly appointed Supreme Court Justice Mumba Malila is one of the youngest Zambians to have ascended to the apex of our courts. We should heartily congratulate him for this feat. Called to the Zambian bar in 1989, Malila’s twenty-plus years of experience as a lawyer place him in a very rare class. There could have been no one better qualified to take up this position than this gentleman. We should commend President Sata and all those concerned for having made this selection. With a swift ratification through parliament, there seems to have been consensus that Malila was the right person for the job of Supreme Court judge. I find several things that stand out with the choice of Malila. Mumba Malila still has about 15 years to contribute to the life of the Supreme Court before he can consider obligatory retirement. In fact, while Zambian judges are constitutionally supposed to retire at 65 (Article 98), the same constitution provides for a presidential retainment of a judge beyond retirement age. Since most Supreme Court judges do stay on after reaching the retirement age, Malila could possibly have more time at the court beyond 2030. This might help provide the stability for a court that sees far too many changes in judicial personnel. 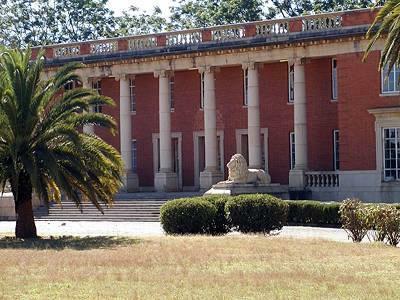 There is no doubt that the Zambian Supreme Court needs some stability. And this stability can best be achieved by hiring much younger and more vibrant persons. This relative young age also means that Malila begins his job with some level of the necessary independence and certain security of tenure. Since he will not be a subject of a judicial contract at least until after he reaches 65, he could serve far much more independently than his colleagues most of whom have already reached retirement age. The Zambian legal fraternity should expect no less independence from Malila. He takes on a huge role. He has huge expectations hoisted upon him. As a Supreme Court judge, Malila should have the freedom and the necessary independence to promulgate human-rights friendly values in the developing jurisprudence of our nation. His most crucial contribution to our nation was when he served as the second-ever chairperson of the Human Rights Commission of Zambia (HRC). President Levy Mwanawasa appointed him to this role in 2004 replacing Justice Lombe Chibesakunda who was the inaugural chairperson (1997 to 2004). Previously, Malila had served mostly in commercial law areas. He also had a stint at the University of Zambia’s prestigious school of law. Malila handled his new 2004 role of defending Zambians’ human rights very well. His stint at HRC saw him get elected to become a vice-chairperson of the African Commission on Human and People’s Rights (serving from 2006 to 2011). He was, undoubtedly, a great advocate for the poor of Zambia. It is therefore, not surprising that President Mwanawasa later promoted Malila from chairperson of HRC, to becoming Attorney General of Zambia (AG) just a couple of years later. It was somewhat our expectation that Malila was going to take his human rights inspired worldview to his new role as Attorney General. But understandably, we all got disappointed. It did appear like Malila had abandoned his faithfulness to protection of human rights. He started to defend even the most despicable of violations from the Government of Zambia (GRZ). As Attorney General, his major client had become the Government of Zambia and its executive. In fact, as AG he became an ex-officio member of the Zambian cabinet. The Malila who stood for human rights, had become, in my opinion, a part of successive governments which were oppressive of those rights. 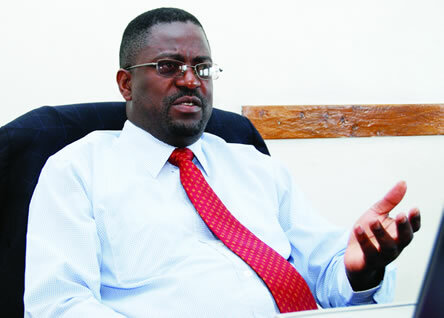 In our writings, both in the Zambia Daily Nation newspaper and on the www.eliasmunshya.org blog, we did express concern at some positions Malila had taken as Attorney General of Zambia. I felt that he had abandoned ordinary and basic human rights in his desire to defend his client, the GRZ, at all cost. For example, we expressed our concerns over his justification for the Public Order Act under the Michael Sata presidency. We expressed our uneasiness over his arguments in supporting the retention of Acting Chief Justice Lombe Chibesakunda, even after the Law Association of Zambia (LAZ) had expressed their discontent. We disagreed with the position he took in trivializing the genuine concerns that Dora Siliya and others had when a support staffer of the judiciary, called Terry Musonda, purported to issue a judicial judgment. We sharply criticized Malila’s court submissions on this matter. We differed with Malila on many points related to the above-enumerated items. In one of our articles, we had stated that Malila could easily make one of the worst Attorneys General Zambia has ever had. We offer no apologies for so holding at that time. Our criticism was a product of its time. Now however, we must have a relook at Mumba Malila. As such, the greatest hope I have in Malila’s court appointment does not rest on his performance as Attorney General; rather it rests on what he could potentially bring to a Supreme Court deeply buried in jurisprudence less favorable to human rights. We await the emergence of human rights influenced jurisprudence from Mumba Malila, a new judge for a modern Zambia. 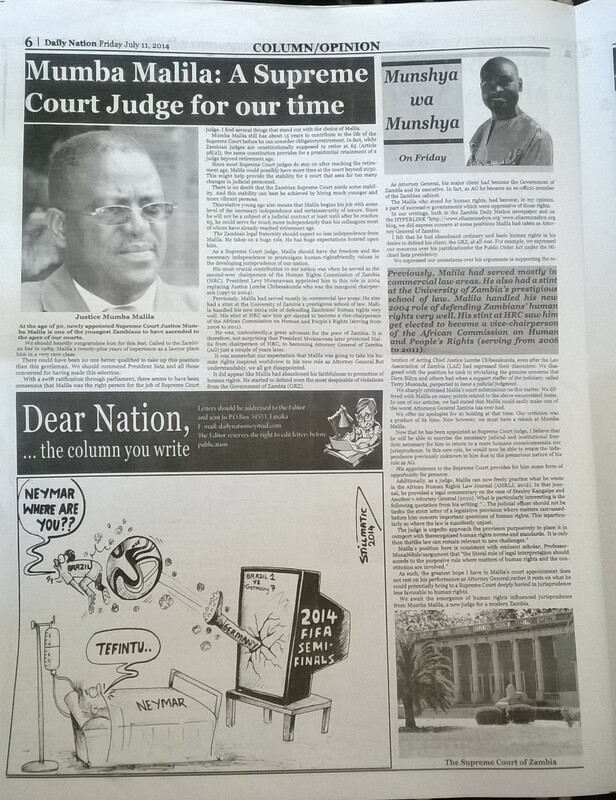 This article also appeared in the print version of the Zambia Daily Nation. 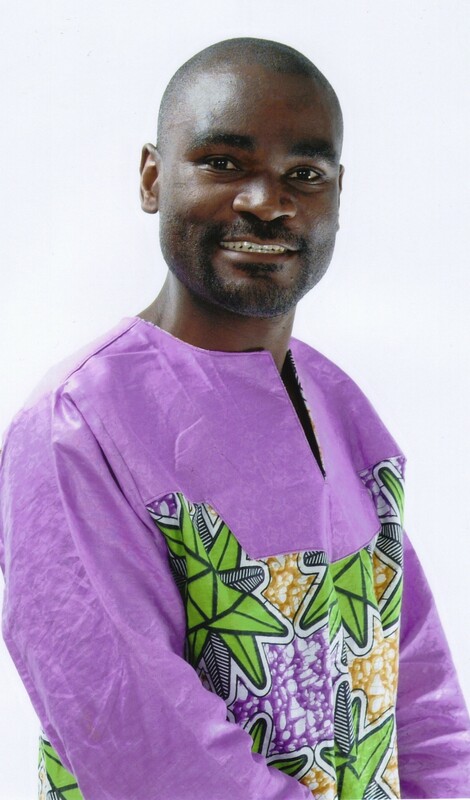 It appeared on Friday, 11 July 2014 Munshya wa Munshya column features there every Friday.